Lorraine Marie Roth: genealogist and historian of Canadian Amish Mennonites, was born 25 February 1930 on a farm near Shakespeare, Perth County, Ontario, Canada to Sidney Roth (19 August 1900-26 January 1975) and Violet Brenneman Roth (5 May 1905-22 October 1975). Lorraine was the oldest child; she had one brother, Howard. Lorraine died 11 December 2013 of age-related illness. From her earliest years Lorraine loved education; she entered grade nine at Rockway Mennonite School in its first year of existence in 1945. She graduated from Rockway in 1949, attended Stratford Normal School, and taught for two years in the New Hamburg Public School. She then attended Goshen College, graduating in 1954 with a BA in Education. She served in Honduras with the Eastern Mennonite Board of Missions from 1954-1962, returning to North America to study at Goshen Biblical Seminary where she earned a Master of Religious Education degree in 1964. She returned to Ontario where she worked at Provident Bookstore until 1969 when she left for a year of travel and family research in Europe. She paid for this trip by doing secretarial work in Europe for the Mennonite Board of Missions and Mennonite Central Committee. Beginning in 1970 she worked at Wilfrid Laurier University, first in the library and later in the Department of German and Romance Languages as a secretary. After the death of her parents she retired, lived frugally on the inheritance from her parents, and devoted herself to historical and genealogical research. Lorraine Roth's genealogical interests were sparked during her high school years when a Brenneman family reunion inspired her to create her first family tree. She published the first of many genealogies in 1963. She returned to Europe on further research trips in 1985 and 1992. In her lifetime, she compiled at least 25 different genealogies and assisted with another 15 or 20. She developed research files on all the Amish Mennonite family lines that immigrated to Ontario in the first half of the 19th century. In 1972 when the Ontario Amish Mennonites were celebrating their 150th anniversary in Canada, Lorraine wrote the 34-page historical text for the booklet, Sesquicentennial of the Amish Mennonites of Ontario. When more records became available in later decades, she authored the definitive The Amish and Their Neighbours: The German Block, Wilmot Township, 1822-1860 in 1998. 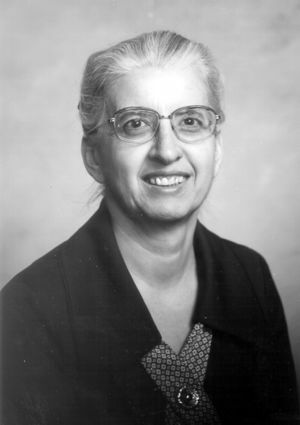 Lorraine Roth served on many historical committees, including those of the Western Ontario Mennonite Conference (1975-1981), the Mennonite Conference of Eastern Canada (1988-1990), and the Mennonite Church (1979-1987). She was a charter member of the Mennonite Historical Society of Ontario (MHSO) and remained actively involved in the society until her death. She wrote numerous articles for MHSO’s newsletter. The Ontario Women’s Missionary and Service Commission asked Lorraine Roth to prepare a collection of short biographies of Ontario Mennonite women leaders. She wrote Willing Service: Stories of Ontario Mennonite Women, published in 1992. In 2010, the Mennonite Historical Society of Canada honored Lorraine with its Award of Excellence for her years of dedicated service to preserving the history of Amish and Mennonite families in Ontario. “Award of Excellence to Lorraine Roth.” Ontario Mennonite History (June 2010): 5. Web. 26 September 2018. Draper, Barb. “Mennonite historian and genealogist Lorraine Roth researched and recorded origins of Amish Mennonites in Ontario.” Canadian Mennonite 11 December 2013. Web. 26 September 2018. https://www.canadianmennonite.org/articles/ontario-mennonite-community-loses-influential-genealogist. Harder-Gissing, Laureen. “Lorraine Roth fonds.” Mennonite Archives of Ontario. 2015. Web. 26 September 2018. https://uwaterloo.ca/mennonite-archives-ontario/personal-collections/lorraine-roth-fonds. Hill, Valerie. “Amish Mennonite historian leaves a rich legacy.” Waterloo Region Record (2 February 2014). Web. 26 September 2018. https://www.therecord.com/living-story/4292127-amish-mennonite-historian-leaves-a-rich-legacy/. “Lorraine Marie Roth.” Stratford Beacon Herald (December 12, 2013). Web. 26 September 2018. http://yourlifemoments.ca/sitepages/obituary.asp?oid=761026. “Lorraine Roth resigns after many years of service.” Ontario Mennonite History (June 2011): 5. Web. 26 September 2018. “Roth, Sidney.” Gospel Herald 68, no. 9 (4 March 1975): 178. Web. 26 September 2018. http://mcusa-archives.org/MennObits/75/mar1975.html. “Roth, Violet.” Gospel Herald 68, no. 48 (16 December 1975): 904-905. Web. 26 September 2018. http://mcusa-archives.org/MennObits/75/dec1975.html. Laurence, Hugh and Lorraine Roth. Daniel S. Iutzi, Jacob R. Bender: servants of God and the church. Waterloo, Ont. : Historical Committee of the Western Ontario Mennonite Conference, 1984. Roth, Lorraine. The Amish and their Neighbours : the German Block, Wilmot Township, 1822-1860. Waterloo, Ont. : Mennonite Historical Society of Ontario, 1998. Roth, Lorraine. Willing Service: Stories of Ontario Mennonite Women. Waterloo, Ont. : WMSC in cooperation with the Mennonite Historical Society of Canada, 1992. Sauder, Dorothy (editor) and Lorraine Roth. Sesquicentennial of the Amish Mennonites of Ontario : programme [and] 150 years. New Hamburg, Ont. : Mennonite Historical Society of Ontario and the Western Ontario Mennonite Conference, 1972. Carr, Lucile, Shirley Jantzi-Boshart and Lorraine Roth. Christian E. Boshart and Catherine Buerge : family history and genealogy. Newport, Oregon: Pioneer Printing, 1978. Gingerich, Alvin, Ruby Gingerich, Keith G. Schrag and Lorraine Roth, editors. The Daniel Schrag family history & genealogy. Kitchener, Ont. : The Editors, 1981. Jantzi, Bruce, Ruthann Jantzi and Lorraine Roth. Roots and branches of the Herrfort/Herford family 1992 : the history and genealogy of the John and Magdalena (Erb) Herford family and the Andrew and Barbara (Wagler) Herrfort family. Wellesley, Ont. : Jo Ann Herrfort, 1992. Jantzi, Kenneth Daniel, Ruth Lichti Jantzi and Lorraine Roth. Joseph Jutzi & Maria Bender family history & genealogy. Kitchener, Ont. : Ken & Ruth Jantzi, 2011. Kipfer, Alfred & Lorraine Roth. John S. and Maria (Gerber) Kipfer : ancestors and descendants. Kitchener, Ont., 1983. Kipfer, Alfred & Lorraine Roth. John Steckly family history, David and Magdalena (Ropp) Steckly genealogy. Waterloo, Ont., 1990. Kuepfer, Menno W., Mrs. Alvin N. Roth & Lorraine Roth. Family history and genealogy of Jacob and Marie (Lichti) Kuepfer. Kitchener, Ont. : The Compilers, 1976. Kuepfer, Mrs. Menno W. and Lorraine Roth. Family history and genealogy of John Jantzi and Elizabeth Gerber. London, Ont., 1974. Kuepfer, Robena and Lorraine Roth. Descendants of Henry and Maria (Stever) Albrecht. Millbank, Ont. : R. Kuepfer, 2002? Litwiller, Mary and Earl Litwiller; edited by Lorraine Roth. Peter Litwiller and Elizabeth Lichti: family history and genealogy. 2nd ed. Petersburg, Ont. : M. & E. Litwiller, 1998. Moser, Katie and Lorraine Roth. Joseph and Catherine (Kennel) Leis genealogy. Waterloo, Ont., 1994. Roth, Lorraine and John Bradley Arthaud. The Jacob Lebold and Magdalena Blank family, 1800-1993: with allied families of Ebersol, Gascho, Neuhauser, Schwartzentruber and Zwalter. Ontario, 1993. Roth, Lorraine. Christian Wagler family. Ontario: L. Roth, 1983. Roth, Lorraine. The Family history and genealogy of Christian Steinman(n) and Veronica Eyer. Baden, Ont. : The Committee, 1990. Roth, Lorraine. Family history and genealogy of Jacob and Catharine (Roth) Schwartzentruber, 1835-1969. Kitchener, Ont. : L. Roth, 1969. Roth, Lorraine. History and genealogy of Jacob and Lydia (Leonard) Brenneman family 1843-1963. Shakespeare, Ont. : L. Roth, 1963. Roth, Lorraine and Bruce Jantzi. The Family history and genealogy of Jacob Wagler and Magdalena Gardner and Barbara Lebold. Wellesley, Ont. : Jacob Wagler Family Book Committee, 1989. Roth, Lorraine. History and genealogy of Joseph and Anna (Kauffman) Roth 1851-1966. Kitchener, Ont. : L. Roth, 1966. Roth, Lorraine. Introduction to Lichti family immigrants to Canada. Waterloo, Ont. : L. Roth, 2003. Roth, Lorraine. Introduction Zehr immigrants from France to Canada and Lewis County, New York. Waterloo, Ont. : L. Roth, 2003. Rev. ed. in 2009. Roth, Lorraine. John and Barbara (Schultz) Oesch family history and genealogy. Kitchener, Ont. : L. Roth, 1964. Roth, Lorraine and Rufus Jutzi. Joseph Jutzi and Marie Bender family history and genealogy. Waterloo, Ont. : Joseph Jutzi Family Book Committee, 1995. Roth, Lorraine. Partial genealogy of the John and Barbara (Birkey) and Catherine (Erb) Schwartzentruber family. Waterloo, Ont. : L. Roth, 2002. Roth, Lorraine. Summaries of Ontario (Amish) Mennonite families. Kitchener, Ont. : L. Roth, 1980-1982. Roth, Lorraine. The Jantzi, Yantzi, Yancey family from Lorraine, France to Lewis County, New York and Ontario, Canada with smaller contingents soon moving on to Iowa and Illinois. Waterloo, Ont. : L. Roth, 1991. Ryan, Ruth Yantzi and Lorraine Roth. The family history and genealogy of Joseph and Catherine (Boshart) Jantzi, Christian and Catherine (Boshart, Jantzi) Riser, John and Anna (Jausi) Ulrich. Kitchener, Ont. : The Authors, 1982. Schwartzentruber, Verna and Lorraine Roth. John and Anna (Zehr) Wagler family history and genealogy. New Hamburg, Ont. : John Wagler Family Book Committee, 1993. Steckly, Elizabeth Bast, Irwin Albert Steckly and Lorraine Roth. Joseph Reschly and Anna Schweitzer family history and genealogy. 2nd ed. Stratford, Ont. : E. & I. Steckly, 2003. Yantzi, Edna Zehr and Lorraine Roth. Nicholas L. Roth and Anna Dienner family history and genealogy. Tavistock, Ont. : E. Yantzi, et al., 2002. Yantzi, Henry, Lorraine Roth and Mae Yantzi. The family history and genealogy of Michael B. Yantzi and Jacobena (Kennel) Yantzi. New Hamburg, Ont. : H. & M. Yantzi, 1991. Yantzi, Henry, Lorraine Roth and Mae Yantzi. The family history and genealogy of Nicolaus and Barbara (Roth) Schlegel. New Hamburg, Ont. : H. & M. Yantzi, 1986. Zehr, Marion, Vernon Zehr and Lorraine Roth. Supplement to Roots and branches of the Herrfort/Herford family published by Jo Ann Herrfort 1992. Waterloo, Ont., 1992. Steiner, Sam. "Roth, Lorraine Marie (1930-2013)." Global Anabaptist Mennonite Encyclopedia Online. October 2018. Web. 26 Apr 2019. http://gameo.org/index.php?title=Roth,_Lorraine_Marie_(1930-2013)&oldid=162240. Steiner, Sam. (October 2018). Roth, Lorraine Marie (1930-2013). Global Anabaptist Mennonite Encyclopedia Online. Retrieved 26 April 2019, from http://gameo.org/index.php?title=Roth,_Lorraine_Marie_(1930-2013)&oldid=162240. This page was last modified on 23 October 2018, at 13:22.